Over the years, I've experimented with many salads. I get tire of cookbooks that put cheese on salads or treat them like side dishes. For me, a salad is just an interesting pile of veggies that taste good mixed together. This salad has many variations. The key to some of food enjoyment is presentation, and what better way to present than to play with color! 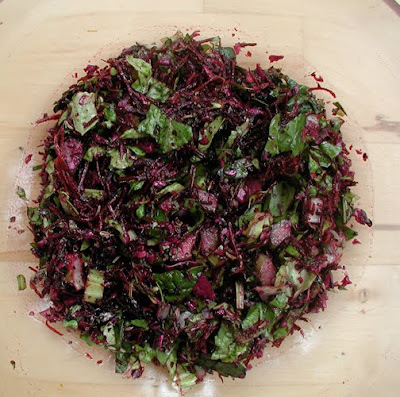 I call this salad "Root Chakra Salad" because it is a magenta salad which is the color of the first chakra. It is also the color of iron. If you feel anemic, this is a great salad to "perk" you up. It is also a warming salad for winter. I've done this salad three ways. I'll list the ingredients for you and then the dressings. The first time I did it, I used red sauerkraut. Here is that recipe. Knead the cabbage and other ingredients, put into a jar (don't put a lid on it) wait a few days until the kraut has the taste you like. Some people get serious about kraut and pack it in a ceramic container all winter--I like it fairly fresh. A good variation on this salad is to use freshly grated red cabbage. You can also substitute (or add) red or purple kale, red lettuce, purple beet leaves, purple flowers, red celery, or other dark red or purple leaves. I don't usually mix beets with any kind of fruit, but elder berries taste good in this salad. I find the beets sweet enough without honey, but honey makes this salad good enough for kids.